This is not a quote by a domain name broker. Again, these are not words of a domain name broker. These are words coming from somebody who has invested millions of dollars in companies and certainly understands a thing or two about branding. With that said, there are always two sides of a fence and some may debate that a great domain doesn’t always matter. We obviously would disagree with this side, but deciding whether or not to acquire a domain name should never be about the sales pitch, automated valuation tools or comparable sales. Your decision should be directly correlated to the value proposition a great domain name holds to the value of your business. Does Amazon need to own every specific product domain name, such as babybeds.com or weddingrings.com? In fact, some would argue this type of domain is only valuable to a brand for: (a) a redirect, (b) brand protection, and/or (c) a defensive play. Because Amazon is the brand, and the danger of diluting that brand by focusing on keyword domains is very real. It also costs a lot more to manage a sea of smaller brands, has possible negative workplace culture effects not having all employees working for the same brand and more. Let’s look at the more-common scenario of why companies buy domains. Many acquisitions today are not the result of a name change, but of companies acquiring a better version of their domain. Almost any brand expert will tell you that consistency is the key to branding. Target cannot be Target in one place, Target Inc. in another, Target Stores somewhere else, Target LLC back at headquarters and TargetCompany.com on the web. They have to be known as Target to get the most bang for their marketing bucks, both internally and externally. Any marketing professional, domain name broker, brand protection company — anyone interested in selling you something — can provide 1,000 reasons why you should make a purchase. Only you can determine how much a domain name is worth to you. However, the value is not always in what is gained — it is sometimes also in what is lost. So we used data to analyze one of the core intangible elements of a domain names’ value proposition. The Human Nature of emails. For privacy reasons, and on the advice of counsel, we cannot mention the domain name. However, this domain is generic enough that anyone who owned it would clearly defend its generic status. It’s a word we all use. And this is just the beginning. According to Ancestry.com, there are over 200,000 births, marriages, and deaths of people with this word as a surname. Some of the more famous people include an NFL quarterback. There are potentially thousands of possible buyers for it across the world. While the owner was interested in selling the domain, he also understood that selling a great domain name at a fair market price is not always an overnight process. In case the domain did not sell, he started to explore some development ideas of his own. What he didn’t realize was what would happen when a catch-all email address was turned on. A catch-all email address can serve many different purposes. The most popular being an option for the owner to create all kinds of email addresses such as info@example.com, name@example.com, development@example.com, etc., without having to create individual email accounts. This provides instant flexibility to create any address for specific reasons. For example, if the owner sets up a Netflix account, they could use netflix@example.com and the “catch all” feature would automatically deliver that email to their preferred address. However, the Left Side of the @ also provides much more fun for great domain name owners. Human nature often leads to the misspelling of a name or two at times, but we also live in a world where shorter is better. Our brains are wired to automatically remove some words when thinking of brands, such as Inc., LLC, etc., and for some companies this can pose a pretty serious problem when it comes to email. Imagine if Google’s website was GoogleInc.com. How many people would type in Google.com? How many employees would send internal email to someone@google.com? How many people email someone@cia.com every day with confidential state secrets? How many job applications for the NSA are sent to the Neptune Shipping Agency monthly? How many people try to order a moving van from Atlas.com? How many employees give out the wrong email to customers every day? These are just some of the question types many people wonder so we looked at emails from this domain over a 30-day period. Wow. Our theory on human nature wasn’t far off. In the last 30 days, the owner had no idea what was about to happen once the email was turned on. He received a total of 261 emails from unrelated addresses relating to his development. Many of these were spam emails, marketing emails or Russian lady friend requests. But there were also emails from employees, contractors, attorneys, job applicants and friends of people at companies that have “Example” in their domain name. For clarification, anytime we use “Example,” we are referring to a user emailing someone@example.com instead of the respective longer / alternative TLD version of the domain owned by the intended recipient such as exampleinc.om, examplellc.com, myexample.com, example360.com. There is also a bleed of email from strong brands who do not use a dot com extension and those who use creative spelling versions of commonly spelled words. That’s 173 emails (66%) which are basically of little importance. One thank you note from a senior vice president. Two proposals from vendors totaling over $126,000 in work. Private financial correspondence to an “Example” property manager, who then forwarded the email to the wrong “Example” email address, showing more than a $900,000 balance in an account, the account number, the account owners and more personally identifiable information. Several follow-up emails with people thanking them for a conversation, a meeting, etc. Loan contracts for a note over $100,000. Establishment for a new phone line where the presumably “Example” employee opened the account with her work email. Statements for an established wireless account where the user used @example.com email. A fully executed real estate purchase and sale contract asking the “Example” employee to have the buyer initial. Documents from several outside attorneys to multiple employees of “Example” for internal review. A link to the “Example” company’s internal intranet login. Several 2015 1099s mailed to “Example” employees for correction. A refund request for $21,464 in overpayment of rent to “Example” company from an accounting supervisor. Approval designs for custom fit machinery for “Example” company. A character and fitness report from a National Bar Association as part of a background check for an applicant. Numerous receipts for “Example” employees. Multiple Google meeting requests to “Example” employees — from both other employees and outside parties. One not-so-subtle email to someone who will never know. If you can afford it, then you need to acquire the preferred version of your domain name. This really isn’t a question. Not owning the preferred version of your domain exposes your company to so many different negative consequences. From security concerns about confidential information, data collection, HR correspondence and employee communication to brand confusion between employees and customers. And 1,000 reasons in between. Almost no one will append a word to your company name. If your company is called Example, no one is going to arbitrarily add Inc., Corp, LLC, Realty, or any other word to an email address. However, they will shorten the domain name and send sensitive information via email without hesitation. Scary? Yes it is. The question you should be asking yourself right now is: Do you know what the preferred version of your domain name is? The preferred version of a domain name is NOT the domain name you like best. It is the word your customers and employees remember the most. It is the word your employees refer to the company as. It is the word you use to explain to people who you are. It is the word you possibly spent hundreds of hours coming up with. It is the word you have spent (ten or hundreds of) thousands of dollars marketing. The preferred version of your domain name is all of this and more. It is not always the domain name you like the best. Remember, the value of a domain name is not what a domain name broker tells you. The value of a domain name is the “value proposition” it holds to you and your company. This could be $100 or $10,000,000. It’s a highly personal question for you and your brand and one that no automated appraisal system can ever calculate. The value of a domain name to your brand can only be measured by you and you alone. Whether or not the seller agrees, that’s another story. Value is not just measured in sales, however. 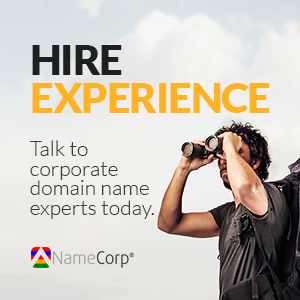 The value proposition of owning the preferred domain name can often lead to stronger brand recognition, greater perceived authority, higher employee loyalty and more. Sometimes just the simple acquisition of the preferred domain name sends employees a better message of long-term dedication than any PowerPoint slide ever will. It can also tell your customers you are growing and becoming more dominant in your industry. If your company is selling rainbow bracelets on eBay with an average order of $4.25, then owning the best version of your domain name may not be that critical. However, if you’re a million-dollar company, a company handling sensitive information, a company providing data solutions, or 1,000 other types of companies, then you really should understand the important of owning the preferred version of your domain name, what exactly that domain name is, and fight for the dollars to acquire that domain proportionate to the value proposition it holds for you. You can choose to bet against human nature. Example.com was NOT a high traffic domain name. Only about 700 people naturally visited the domain name in the last 30 days (about 25 a day). There was no mention or link to any @example.com email anywhere on the domain names landing page for this 30-day period. All of these emails were sent to somebody@example.com — not generic emails like info@, support@, webmaster@ example.com, etc. Those were discarded. No emails were included that resulted from a form submission on the current landing page (hosted by us).